What is the point of education ? What is one educated for ? What is the purpose of an educator ? Is it important to implement education ? 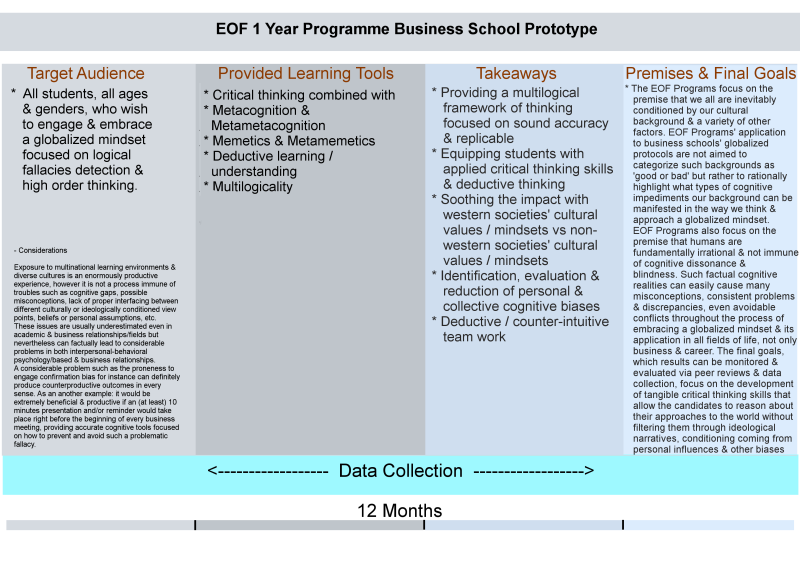 As EOF Project we are creating experimental programs and propose them to high schools and university students (including teachers / tutors / educators). Our programs regarding education theoretically cover one scholastic year and consist in weekly webinars and workshops which can be done both in person or on line. However the programs can be modified and made flexible. In our programs we combine critical thinking with deductive reasoning, multilogicality, metacognition, memetics and metamemetics. We consider the study of memetics and the development of what we call metamemetic thinking skills to be a fast manner to implement proper reasoning among students and candidates. Deep metacognition refers to the careful and critical observation of one's cognition: the way one thinks, the psychological passages, links and manners to approach and process information, thoughts, emotions and memories, therefore allowing the decoding of eventual flaws, biases, unhealthy conditioning and logical fallacies. However all of this can be quite hard when performed by an adult mind considering that we haven't received an education pivoted and based on such valuable psycho-cognitive instruments. The EOF's metaeducation project focuses specifically on this issue offering an experimental program applicable to high schools and universities and single individuals. The purposes of the program are: data collection to provide evidence and reproducibility (analyzed and reported throughout at least one scholastic year), and improvement of students' (and tutors) thinking skills regarding cognitive self-analyses, decision making processes, detection of logical fallacies, refining of thought, critical thinking and sound accurate skepticism. A) What is the true function of an educator? B) What is a qualitative education (versus assimilative education)? C) What is the purpose of being educated (what are we educated for)? D) Are we properly educated? E) What is the social impact of traditional education and what would be the impact of metaeducation? What should be the function of an educator? Making the student learn, repeat and perform the replication of learned material in order to pass the assessments? We can easily discharge this by calling it flawed education because it's not only and mainly aimed to make the students fit into a certain social structure but it also functions as a meme does, or a memetic pattern: it mainly cares about the repetition and replication of contents and the status quo of certain learning modalities, with eventual variations about the evolution of the contents, but it usually possesses a very scarce analysis and criticalness regarding what's learned. Perhaps traditional education can produce efficient workers but does it also produce efficient minds? Traditional education is not qualitative in terms of critical thinking skills; despite some students are eventually able to achieve considerably high scholastic results, this does not necessarily mean that such students have also developed high order thinking skills which are necessary to critically understand what has been assimilated in terms of knowledge and information, as well necessary to go through the personal life without getting easily tethered to fallacious beliefs, erroneous manners of thinking, biased life-trends, logical fallacies and ideological or faith-based mindsets. Current education is mainly assimilative: meaning assimilation of data, while it deeply lacks of criticalness and analytic quality. The idea regarding the process of being educated as a doorway towards personal (and social) success and construction of individual reputation is a powerful social meme which influences greatly the common sense and purpose concerning education itself. This reality can result in an economic and general social betterment perhaps, but it does not result in a psychological and psychosocial betterment and actually tends to deteriorate healthy thinking skills. By analyzing current educational systems and their outcomes we can determine that even when individuals are well educated they nevertheless possess a scarcely efficient ‘psychological immune system’ regarding logical fallacies, broken logic and flaws in thinking processes. Metaphorically speaking we can describe this like a condition of having learned more or less decently how to drive a car mixed together with the condition of not having sufficient attentiveness while driving that car. Current education produces dynamics aimed to make us fit into social schemes and contributes to provide the nourishment a society requires in order to preserve itself and evolve. However such an evolution appears to be memetic (a memeplex) because it mainly focuses on social/economic/technological betterments but not on betterments regarding the abilities in thinking patterns of the individuals that live within a certain social system. ‘Metaeducation’ (education about education, or ‘educating education’) instead provides a crucial impact in modern society because it trains students / tutors / teachers / individuals to develop cognitive skills, deep mind and qualitative critical decoding of influences and memetic conditioning (ergo it develops ‘metamemetic thinking’ or ‘anti-memes thinking’). Metaeducation, practically speaking, can really produce significant mutations even within one single generational passage. Mutations in terms of rise of secularism, decreasing of division and conflicts caused by beliefs and ideologies, and reduction of discrimination, iniquities, memetic addictions, superstitious anti-scientific thinking and general non-clinical mental disorders; as well it can boost social progress in every sense and refined thought processes.